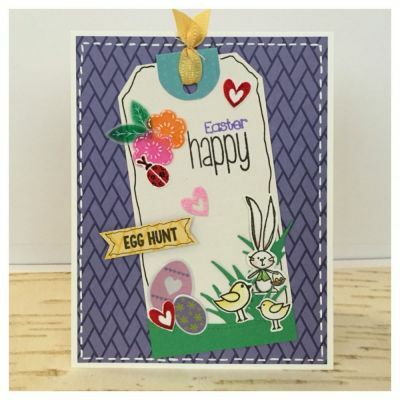 Since I was having a bit of a card making block, I decided to stamp a bunch of happy with images: flowers, bunnies (I don't have any TSOL bunnies yet), hearts, so I used an old stamp that I had. TSOL colors, paper, products all work together so well that ideas started flowing. The results just puts a smile on my face. Lovestory4kitclub, blessings4ktclub, & trees2 build stamps; happiness & blessing collection patterned paper; and grape & licorice ink pads. Cute card. I always love using tags on cards.